In 2017, the AHA produced new guidelines for LVAD patients and other patients with mechanical circulatory support including total artificial hearts. SNGH has since updated their guidelines to reflect the changes. 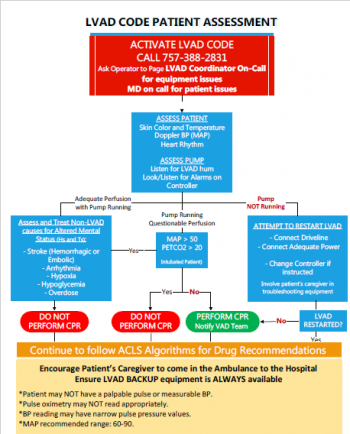 Please review the new flowsheet for EMS care and treatment as there are some changes including the provision of performing CPR and ACLS when certain criteria are met. Remember that LVAD patients will be transported to SNGH. First, involve the family/caregivers and start your assessment. Verify DNR status. If the patient has adequate perfusion and the pump is running, do not perform CPR and look for alternate causes of the patient’s condition. If the pump is not running, you have verified adequate power and connections are present AND the controller has been changed if instructed, you may perform CPR. You may also perform CPR if you verified that the MAP is less than 50 and ETCO2 is less than 20 while the pump is running if there are no other potential causes. There are patients that may seem to meet the CPR criteria but you will be instructed not to perform CPR. Each patient is different and destination therapy vs bridge to transplant may have different requirements. Please contact SNGH LVAD staff for guidance on pump and patient care-they are the experts! Please visit https://www.ahajournals.org/doi/pdf/10.1161/CIR.0000000000000504 for the AHA scientific statement. The www.mylvad.com website has information on all pumps including an EMS guide and is a great resource. Previous Article Previous Article: No A/C in the back? Check this first!